Prior to Greece becoming the economic and financial basket case of Europe, it was Ireland that held that dubious distinction. For when the global economic and financial crisis detonated with full fury in the fall of 2008, Ireland’s own version of the real estate asset bubble imploded, transforming the balance sheets of the nation’s major banks into a toxic waste dump. As with America and the UK, Irish politicians informed their nation’s citizens that the big banks must not be allowed to fail, and therefore the taxpayers would pay for the egregious financial miscalculations of the high-priced “talent” that led these Irish financial institutions into the abyss. While the United States came up with its TARP taxpayers bailout, Ireland formulated its own unique response, the so-called NAMA, the acronym for National Asset Management Agency. NAMA was, in effect, a “bad bank,” which would take the toxic assets off the balance sheets of Ireland’s large banks, in particular the Anglo Irish bank, in return for sovereign bonds. The expectation was that Irish taxpayers would have to accept large losses, but in return the nation’s banks would return to fiscal health, and be able to resume normal patterns of credit and loan creation. The “bad bank” approach had many critics, appalled that taxpayers money was being used to backstop private sector losses, in exchange for vague promises by politicians that the end result would be therapeutic for the national economy’s ills. No less an authority than Joseph Stiglitz, Nobel prize winning economist, expressed great scepticism over the efficacy of Dublin’s taxpayer funded bank bailout. Onward with the “bad bank” concept the government proceeded, anyways, oblivious to its critics. Now the Irish political leadership has informed its sombre citizenry that the banking crisis was far worse than first believed. When NAMA was first established, the authorities believed that the toxic loans being acquired for the “bad bank” would need to be discounted by 30%. Now, an embarrassed government concedes, the actual discount of these toxic loans are coming in at a far worse level, a miserable 47%. Ireland’s beleaguered Finance Minister, Brian Lenihan, has stated that the Anglo Irish bank alone would be receiving from the taxpayers €8.3 billion in just the coming week, with a strong possibility that an additional €10 billion would almost certainly be required to cover anticipated losses at Anglo Irish Bank. All told, it is now being declared by Dublin that toxic loans by Ireland’s banks may cost taxpayers a staggering €32 billion, equal to more than $43 billion at the current exchange rate. Considering that Ireland has a population of 6.2 million, this reflects a charge of nearly $7000 for every Irish man, woman and child towards the cost of bailing out financial institutions that, in the words of Finance Minister Lenihan, “played fast and loose” with Ireland’s national economy. In the months prior to the worsening financial situation in the United States combusting in 2008, there were plenty of prognosticators. The closer one got to official government circles and mainstream media, the more upbeat and positive the forecasts became. It was in the area of unofficial sources where one encountered the most accurate prediction of what was to unfold. I recall how NYU professor Nouriel Roubini came out with a checklist of what would unfold months before the collapse of America’s major investment banks. He was pilloried as “Dr. Doom,” while those who abstained from drinking the official Kool-Aid marked off his checklist with an uncanny lack of interruption, as the global financial system headed towards catastrophe. My views, as expressed in The Sydney Morning Herald and elaborated on in detail in my book, “Global Economic Forecast 2010-2015: Recession Into Depression,” are presently far from the perspective of officialdom, policymakers and mainstream media pundits. Yet, as major economies sink deeper into irreversible public debt, and sovereign debt crises have emerged in Greece and Dubai, I have begun to mark off my own checklist, as the global economy accelerates on the road to fiscal calamity. In our enlightened Western, capitalist, free enterprise democratic world, we have a most liberal and benign way of punishing those responsible for massive systemic financial and economic malfeasance. We bail them out, at taxpayers expense, and allow the captains of failed institutions to reward themselves for their miscalculations and greed with massive bonuses, while the public at large is “rewarded” with massive sovereign indebtedness and unemployment. On the other hand, the Stalinist anachronism that is North Korea has a somewhat different approach to those held accountable for economic disasters: the firing squad. So it was that Pak Nam-ki, chief for planned economy for the DPRK’s ruling party, met his end amid a hail of bullets. Supposedly, he was shot for being a stooge of an imperialist dog of a bourgeois counterrevolutionary. The truth, however, is much more interesting. The ruling communist monarch of North Korea, Kim Jong-il , son of the nation’s founder and officially infallible, decided on a major currency reform. The reform was a disaster, leading to a steep rise in price inflation and the wiping out of the meagre savings of most North Korean families. Someone had to pay for this outcome, however the nation‘s ruler, Kim Jong-il , being the “great leader” and therefore incapable of mistakes, could not be blamed. According to press reports, the unfortunate Pak Nam-ki was selected as the sacrificial scapegoat, and was shot. While North Korea is clearly an extreme case, should the global economy deteriorate in the manner I expect, it is highly probable that ruling elites in the Western world will also look for scapegoats to satisfy public anger, as opposed to bailing out Wall Street in perpetuity. For more than a year, I have been warning in my blog of the acute risk to the global economy stemming from out of control public spending in major and advanced economies. 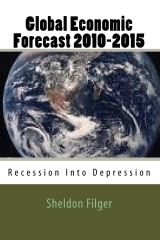 My new book , “Global Economic Forecast 2010-2015: Recession Into Depression,” amplifies my warning with data and trend analysis. The bottom line in my forecast: the current level of public debt and deficits in large economies, in particular the United States and United Kingdom, is unsustainable, and will inevitably lead to a profound sovereign debt implosion, sparking a synchronized global depression (my book is available on Amazon.com, can be downloaded as an Amazon kindle, or can be purchased directly from this website, http://www.globaleconomiccrisis.com). Now, a growing chorus of authoritative figures in the world of economics and finance are echoing my warnings. As reported in Bloomberg, the International Monetary Fund’s first deputy managing director, John Lipsky, speaking at the China Development Forum in Beijing, said “this surge in government debt is occurring at a time when pressure from rising health and pension spending is building up,” leading to major economies being confronted with “acute” fiscal challenges. The IMF official warned that even if these countries exit from their so-called economic stimulus measures, this won’t even come close to confronting their growing public debt gap. Lipsky’s remarks follow on the heels of another bleak warning that emerged from the co-chief investment officer at Pimco, Mohamed El-Erian, which I reviewed in a previous post. He spoke frankly of the danger that sovereigns will attempt to inflate away their excess public debt, or even default. When individuals of the rank of Mohamed El-Erian and John Lipsky discuss openly, on the public record, the alarming growth of public indebtedness, then only an ostrich can conclude that there exists no sovereign debt crisis. While much of the world’s business press is focussed on the Greek debt crisis, the threat to the euro and the possibility of the IMF entering the fray, the co-chief investment officer of Pimco, the world’s largest manager of bond funds, has offered insights on what he sees as an even greater threat to the global economy. Dr. Mohamed El-Erian reacted to the recent assessment that came from the ratings firm Moody’s, which suggested that the United States and the United Kingdom faced a growing threat to their AAA debt ratings, as their public finances accumulate ever larger deficits. What are the odds that we will see “a credible medium term fiscal adjustment program” from the UK and US political establishment? Not good, in my view, which means a ratings downgrade for US and UK sovereign debt is inevitable, making insolvency an increasingly likely scenario for these two economies. Amid the clamour over the Greek debt crisis, a far more perilous threat to the global economy is becoming increasingly apparent. The global economic and financial crisis has wrecked havoc on the United Kingdom’s public finances, with no clear path to salvation. Consider the following statistics. Greece has a GDP of approximately $350 billion, compared with $2.2 trillion for the UK. In other words, the Greek economy is only 16% the aggregate size of Great Britain’s. The proportion of Greece’s annual deficit to GDP is 12.5%, a figure that has triggered the current Greek sovereign debt crisis and panic search for a bailout formula within the Eurozone. Yet, in the much larger UK economy, the deficit to GDP ratio has reached 13%, an even higher level than for Greece, which has aroused so much fear among global investors and policymakers. Furthermore, while the UK’s official public national debt comprises 68% of GDP, a figure lower than America’s and much lower than with Greece, that level of indebtedness is accelerating at a rapid rate. It must be recalled that only three years ago the UK national debt to GDP ratio was only 38%, and with double digit deficits now an inescapable fiscal reality in the United Kingdom, it seems almost certain that the nation’s public debt will exceed 100% of GDP within the next three years. Furthermore, it is widely believed by analysts and investors that off balance sheet public debts (as was similarly revealed in relation to Greece’s current debt crisis) and unfunded contingent liabilities significantly add to the official figures. In effect, the UK economy is at a dangerous tipping point. Massive public indebtedness occurred as a result of the government’s bailout of its banks, yet businesses remain afflicted by a severe credit crunch. Massive stimulus spending has added enormously to the deficit, but the only result has been suspect figures that, if interpreted most optimistically, show that the UK’s economy has essentially flatlined after incurring a sharp contraction in economic output during the height of the global financial crisis. The predictable outcome, as alluded to by Kornelius Purps, is that in the future the UK’s treasury gilts will be unable to finance the nation’s prodigious borrowing needs with historically low interest rates. At some point, perhaps sooner than many realize, interest rates on the UK’s debt instruments will rise precipitously. This will occur while GDP growth is at best sluggish. Sharp reductions in public spending will almost certainly tip the economy back into deep recession, further constricting revenue and maintaining London’s fiscal imbalance. However, the alternative is even more unpalatable. The sovereign bond market will demand increasingly higher yields, leading to a fiscal reality that is unsustainable. Ultimately, the United Kingdom will face the real prospect of national insolvency, with all the predictable dire consequences. This grim trajectory has an even darker meaning for the United States. As bad as the UK’s fiscal situation is, America’s is far worse. Its annual deficit to GDP ratio is only marginally lower than Great Britain’s. Furthermore, its national debt to GDP correlation is significantly higher. More importantly, the average period of turnover on the United Kingdom’s debt is 14 years, compared with a mere four years on U.S. Treasuries. Once bond yields start to rise, the short term structure of America’s national debt will incur a vast increase in annual interest payments. It seems to this observer that it is only a matter of time before the UK sinks into an irreversible sovereign debt cataclysm, with the United States not far behind. Anyone who believes that the same political establishment and financial elites that have led both nations to this hellish fiscal precipice can now lead us to a sustainable solution is, in all probability, being excessively hopeful. U.S. Federal Budget Deficit Spiralling Towards Doomsday: Is the Mother of All Sovereign Debt Crisis Nightmares Just Ahead? According to the U.S. Treasury Department, America’s federal government set a record for red ink in February 2010, accumulating a deficit in just that one month of $221 billion. In comparison, the deficit for February 2009 was $194 billion. Year on year, the February deficit grew by 14%. No doubt, the Obama administration is spending and borrowing at a record pace, in order to put as much of a dent as possible in America’s staggering unemployment number before the midterm election in November. Thus, short term political expediency is given a higher priority than the long term fiscal health of the nation. The massive U.S. government deficits are not only a function of rapacious federal spending, but also a reflection of plummeting revenues. In the year to date corporate tax receipts were $45.4 billion, compared to $52.8 billion during the same period in FY 2009, while individual income tax receipts declined by 14%. Where does this end? Bar an economic miracle leading to instant double-digit real growth, fiscal doomsday lies before us, as policymakers in the United States and other advanced economies sail on at flank speed towards the mother of all sovereign debt crises. Economic and financial history seems to be repeating itself, in an utterly surreal example of hubris and mockery. When residential real estate prices in the U.S. began collapsing and the sub-prime mortgage market imploded, Federal Reserve Chairman Ben Bernanke and his then sidekick, Treasury Secretary Hank Paulson, boasted that their brilliant intervention had “contained” the crisis, preventing it from spreading into the broader American economy. Well, in hindsight, they were partially right. The sub-prime debacle did quite spread, or rather only spread, to the wider U.S. economy. It merely metastasized across the world, bringing about the global economic crisis. It now appears that the head of the International Monetary Fund is doing the same thing. Dominique Strauss-Kahn, the scandal-prone managing director of the IMF (he had previously been involved in a highly publicized intimate tryst with a female employee at the IMF, triggering a legal investigation into his conduct) has just offered his pontification on the potential systemic risks connected with the ongoing Greek public debt and deficit crisis. He told the news agency Reuters that “there was no reason to expect that Spain and Portugal will need external financial support to get to grips with their public debt.” The IMF boss, in essence, claims that the Greek debt crisis will not spread to other regions of the Eurozone experiencing high levels of public debt to GDP. His calming words will probably fool few investors. Obviously, Dominique Strauss-Kahn has engaged in PR spin, as his attempts at downplaying the growing public debt to GDP ratios throughout the Eurozone and in the UK, not to mention the United States, are absurd beyond all measure. More importantly, he has illustrated in his own uniquely obtuse fashion that the IMF is an increasingly irrelevant institution as the mounting public debt levels ensure that a massive sovereign debt crisis is ahead of us all. High noon in the high Arctic is fast approaching, as the people of Iceland get set to vote on March 6 in a national referendum on a plan to compensate the British and Dutch governments for their payments to deposits in their respective countries who lost money in the collapse of Iceland’s banks. It was one of these banks, Landsbanki, which ran Icesave as an online bank that enticed foreign depositors by offering above market rates of interest on accounts. Under immense pressure from the UK and the Netherlands, the government in Reykjavik agreed to pay back more than $5 billion to the two governments, representing a significant part of Iceland’s GDP over several years. 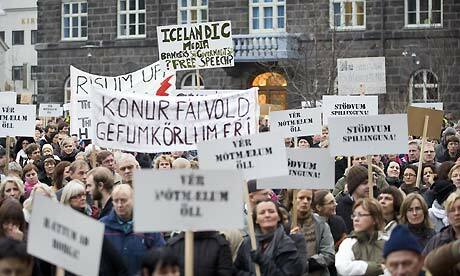 Widespread disapproval of the agreement by the people of Iceland led the nation’s president to decide not to approve the agreement, but rather allow the people of Iceland to exercise their sovereign right on the fate of the Icesave agreement through a national referendum. Despite warnings of economic and financial isolation parallel with economic disintegration emanating from the Icelandic government and the UK and Dutch authorities, it seems almost certain that the Icesave agreement will be overwhelmingly repudiated by Iceland’s voters. In 1953, manufacturing comprised 28.3 % of America’s total economic output. This was a postwar high, capping the immense industrial build-up that occurred during World War II, when the United States became the world’s “arsenal of democracy.” The industrial might of America and her massive manufacturing base is what ultimately led the USA out of the Great Depression. Unfortunately, the once might American industrial capacity has been allowed to wither on the vine, as a new elite engineered the rise of the financial sector as America’s most significant economic field. In the interim, U.S. industrial plants have been “outsourced,” that euphemism for the nation’s deindustrialization. By 2006, just prior to the onset of the Great Recession and global economic crisis, manufacturing represented only 12% of America’s GDP. Financial engineering has replaced industrial engineering in the United States, while the government proportion of the total economy surges simultaneously with the shrinkage in manufacturing capacity. The very nature of the taxpayer funded automobile manufacturers’ bailout, involving the government subsidized downsizing of the industry, is a metaphor for the apparently irreversible decline of the once-mighty manufacturing and industrial behemoth that existed in America. According to the elites running America’s economic policymaking, it makes sense to accumulate massive public debt to save the financiers and Wall Street bankers from their own costly mistakes, while ignoring the decline and fall of the U.S. industrial empire. I believe history will render a most harsh and unforgiving verdict on this myopic and irrational policy of economic suicide.